Kitchisen is a 2-Michelin star kaiseki restaurant in Kyoto, in a quiet neighbourhood northeast of the imperial palace complex and sitting right next to a park. 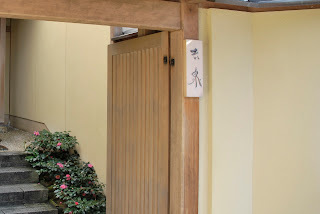 As with many of these restaurants, the entrance was very discreet and we initially had some difficulty locating it (Japanese street names and unit numbers can be hard to decipher at times). We were about to call the hotel for directions until we stumbled upon it. The staff here spoke no English, but they were very courteous (as we have come to expect in Japan) and led us to a private tatami room with a wide open window overlooking the park. We proceeded to order a bottle of Asahi each ("biru... Asahi.." was the extent of our Japanese) and left the food in the good hands of the chef. 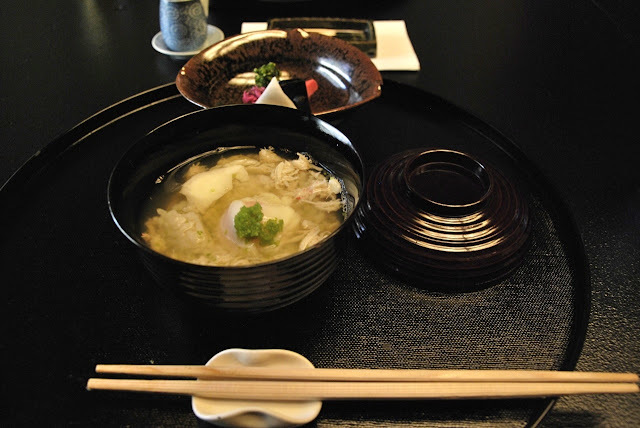 There were no menus and despite the best efforts of our young server, we could not understand what he was saying when he introduced our dishes (this is quite a common experience for us in Japan, we just go along and figure out what we are eating by ourselves). 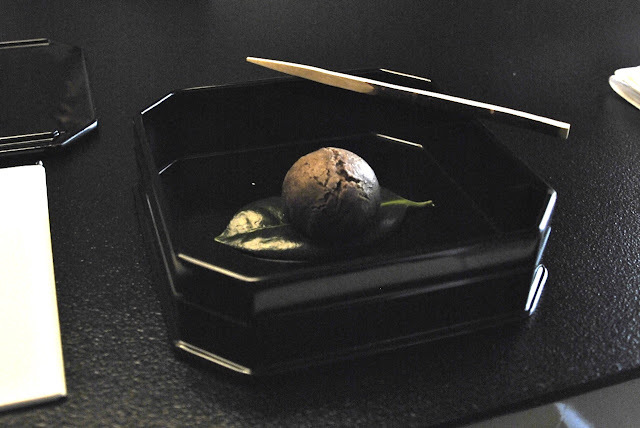 We were started off with a pastry filled with red-bean paste which we thought was more suitable as a dessert, then came some light appetizers in pretty tableware. 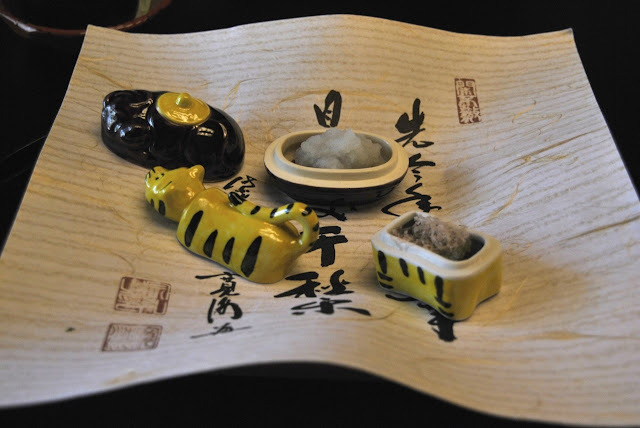 This was followed by a steamed lobster wrapped in dried bamboo stalks (which looked like they had been picked up from the park outside our window), tofu and some prawns covered what looked like green peppercorns but tasted like peas. 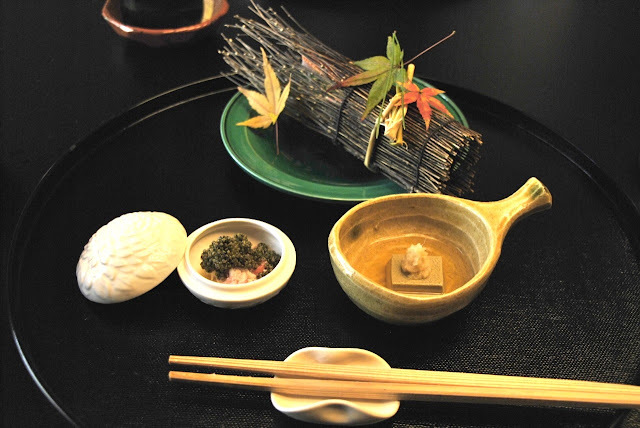 Kaiseki restaurants create their menus based on the seasons and the ingredients available, and we would not have been surprised if most of the ingredients in our meal here were grown within a 100m of where we were sitting. Our next dish was a light and refreshing fishcake and mushroom in consomme with strips of yuzu peel. 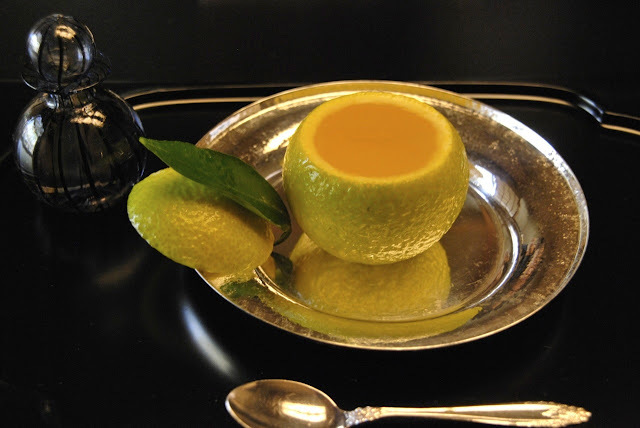 The bitterness of the yuzu peel complimented perfectly the clear taste of the soup. Then we had a visual treat: sashimi in snow, accompanied by a white carrot. 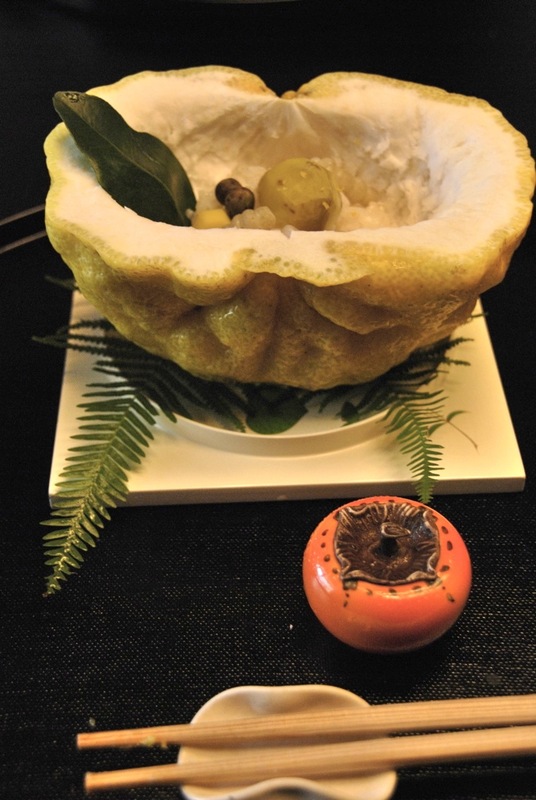 This was followed by chestnuts and rice served in a giant yuzu (as large as a size 4 football). The yuzu gave the rice a slightly citrus flavour which went well with the steamed chestnuts. At this point, we were already starting to feel quite full, but had no way of knowing how much more food was going to come (the server would only come in to clear our plates and present the new dish, in any case, we were unable to communicate with him). 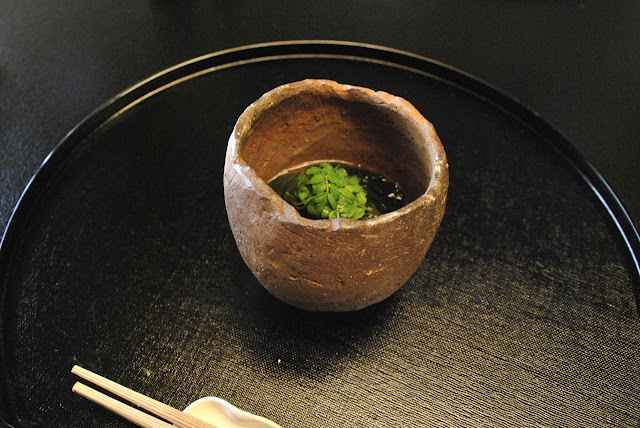 Fortunately, the next dish was another clear soup, with seaweed topped with fern leaves (which we took for a palate cleanser for the main course). 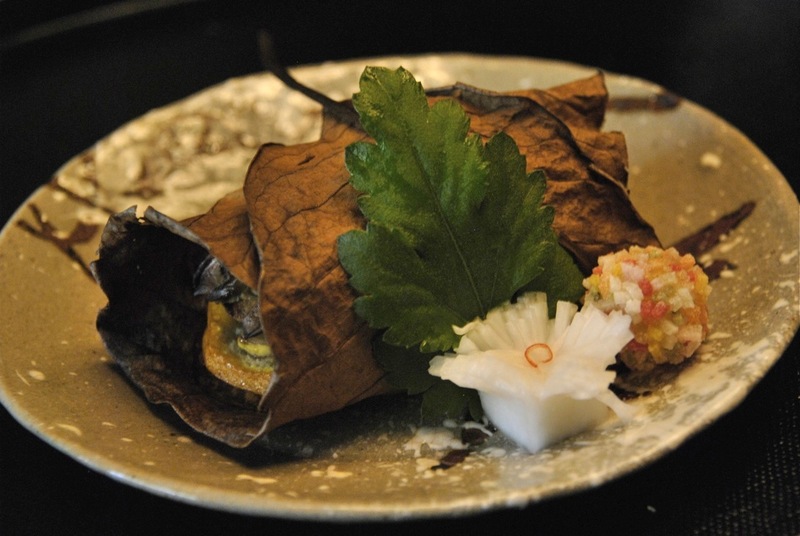 The next course was the miso cod grilled in a large leaf, followed by the filler; a rice in consomme with crab meat and poached egg. 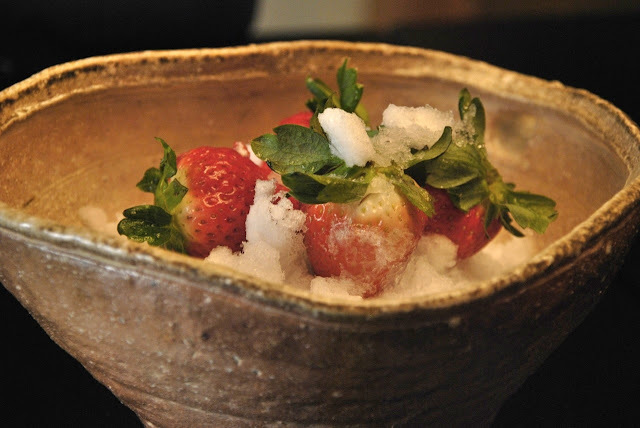 Desserts were strawberries in snow (unnaturally sweet, much like many Japanese fruits), and yuzu jelly in a hollow orange with a vial of orange liquor. The fruit desserts were a very appropriate end to a very 'healthy' but nonetheless filling meal. Final Thoughts: From start to finish, this entire meal was an experience in 'zen'; from the tatami room with the view of a deserted park (the room was so quiet that when we weren't talking, we could literally hear the breeze go by outside our window), to the discreet and unobtrusive service, to each and every dish which highlighted the local fresh winter produce, and the very essence of balance brought out by each course (no dish was too salty, sweet, sour or bitter). 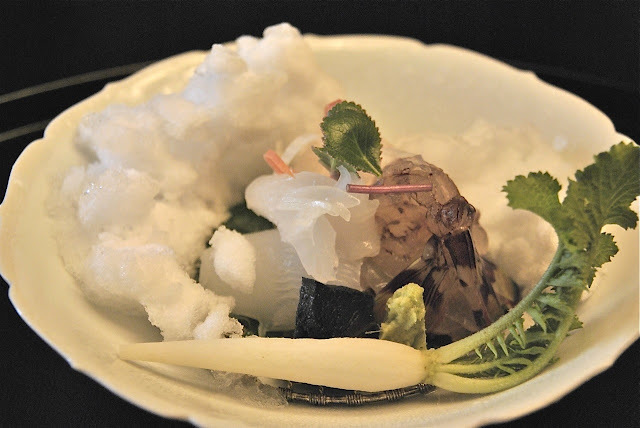 No dish in this meal had, on its own, the 'slurp' factor like white truffle tajarin or a steaming bowl of prawn noodles, but taken in its entirety, together with the environment, tableware, presentation and service, was an unforgettable meal nonetheless. 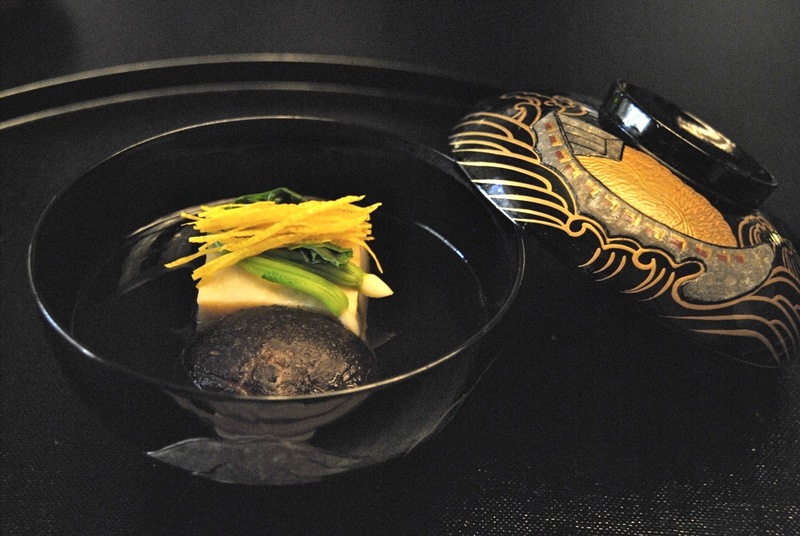 A true kaiseki experience. For people who don't eat their greens and insist on having a large chunk of red meat as part of their meal, don't bother.